From left: Dauda Ajuwon, Acting Director, Inspectorate Department; Emmanuel Igbinosun, Technical Assistant to the Permanent Secretary; Bolaji Adebiyi, Permanent Secretary, Nigeria Federal Ministry of Labor; OSHA Deputy Assistant Secretary Loren Sweatt; and ILAB Africa Area Advisor Olaoluwa Abina. 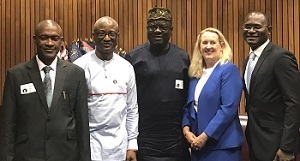 On July 9, Deputy Assistant Secretary Loren Sweatt welcomed the Permanent Secretary of Nigeria’s Federal Ministry of Labour and Employment and a delegation to OSHA. During their visit, agency directors provided information about workplace safety enforcement policies and procedures, the rule-making process and cooperative and state programs. The meeting came as a result of the Ministry requesting technical assistance on labor inspection and occupational safety and health from the U.S. Department of Labor’s Bureau of International Labor Affairs. Through an alliance with OSHA, the National Association of Landscape Professionals (NALP) will host a free webinar on July 25 focusing on heat illness prevention. Understanding heat stress hazards and solutions is crucial to the safety and health of landscape and lawn care workers. Visit the NALP website to create an account and register for the webinar. See OSHA’s website for resources on how to keep workers cool and healthy whether their jobs expose them to indoor or outdoor heat hazards. Design Roofing, LLC, was cited for exposing employees to fall and other safety hazards at two residential construction sites in West Virginia. The company faces proposed penalties of $101,988. OSHA issued willful violations for the fall hazards, and serious violations for improper use of an extension ladder, and allowing employees to work near an energized electrical conductor. For more information, read the news release. North Florida Shipyards, Inc., was cited after a worker drowned when a pressured air manifold struck and knocked him into the St. Johns River in Jacksonville. The company was cited for exposing workers to struck-by, drowning, amputation, caught-in, and electrical hazards; allowing scuba divers to work unaccompanied by another diver; and failing to ensure that machines had proper guarding. OSHA proposed penalties totaling $271,061. Read the news release for more information. OSHA cited Miami-based Bakery Corp. for exposing employees to caught-in, fall, and electrical hazards. Inspectors found that the company failed to properly ground portable fans, train employees to operate a powered industrial truck, take defective ladders out of service, and provide eyewash equipment for employees working with corrosive chemicals. The bakery faces $67,261 in proposed penalties. For more information, read the news release. Cleary Pallet Sales, Inc., faces $216,253 in fines after 10 employees required emergency medical treatment for carbon monoxide exposure. OSHA’s inspection found that employees were exposed at nearly 10 times the permissible exposure limit. The company was cited for failing to address high carbon monoxide level warnings, ensure adequate machine guarding, and train workers on hazardous communications and forklift safety; and for allowing employees to operate defective forklifts. Read the news release for more information. California OSHA issued 11 citations and $97,430 in penalties to Pixior, LLC, after a worker was struck by a forklift. Inspectors determined that the company failed to perform an assessment of the workplace to determine if hazards were present, ensure that forklift operators were trained and evaluated, and prevent forklift operators from carrying loads that obstruct their view. The Hawaii Occupational Safety and Health Division issued nine citations and $198,828 in penalties to the City and County of Honolulu Board of Water Supply for exposing workers to trenching and excavation hazards. Inspectors concluded that the employer failed to provide a safe means of exit, properly install a shoring system, and control the accumulation of water in a trench where three workers were installing a water main. The utility was cited for these violations in 2014 and 2017. AeroFab, Inc., a parts manufacturer for the defense and aerospace industries, worked with OSHA’s On-Site Consultation Program to identify and correct machine guarding, electrical, housekeeping, and improper labeling hazards at its facility in Nicktown, Penn. AeroFab implemented a formal incident investigation procedure, a process to identify injury trends through first-aid data, and an action plan to establish and track safety goals. Over three years, AeroFab's rate of total recordable injuries was less than half the industry average. This led to the company’s acceptance into OSHA’s Safety and Health Achievement Recognition Program. For more information, read the success story. 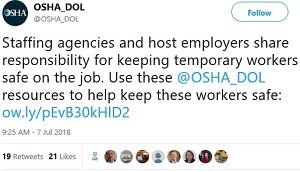 OSHA and Holder Construction Group LLC, have signed a partnership agreement to promote worker safety and health during the construction of a data center in Bridgeport, Ala. 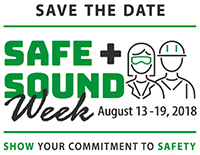 Under the agreement, contractors will present weekly training on common hazards such as falls, noise, rigging, heat, silica, lead, and asbestos exposure; as well as the proper use of respirators and personal protection equipment. The Strategic Partnership Program provides opportunities for OSHA to partner with stakeholders to create safe and healthful work environments. The Associated Builders and Contractors–New Orleans/Bayou Chapter renewed a five-year agreement to prevent exposures to struck-by, falls, caught-in/between, and electrical hazards in the construction industry. The Massachusetts Association of Vocational Administrators, Massachusetts Federation of Teachers, and Massachusetts Teachers Association renewed a five-year agreement to prevent exposure to safety and health hazards in schools. The Regional Hispanic Contractors Association renewed a three-year agreement to prevent exposures to struck-by, falls, caught-in/between, and electrical hazards, and provide information on workers’ rights and employer responsibilities. When done safely, trenching operations can limit worker exposure to cave-ins, falling loads, hazardous atmospheres, and hazards from mobile equipment. The best way to prevent a trench collapse is to slope or bench trench walls, shore trench walls with supports, or shield trench walls with trench boxes. 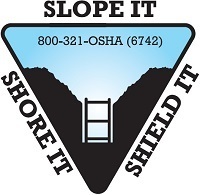 The new “Slope It, Shore It, Shield It” sticker can be affixed to equipment on a worksite. To order, visit OSHA’s Publications page. 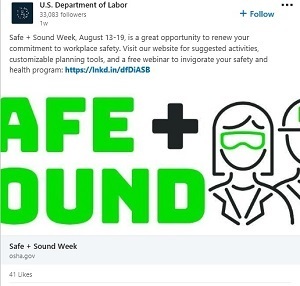 Workers are most engaged in safety and health programs when they have a personal connection to safety. The Making Safety Personal resource encourages workers and managers to think about why workplace safety matters in their lives. The American Society of Safety Professionals’ free, on-demand webinar, “How to Design and Hold Great Safety Meetings,” presents ways to make safety meetings more engaging. Avian influenza, commonly known as "avian flu" or "bird flu," is a disease that can be transmitted from infected wild and domestic birds to people. 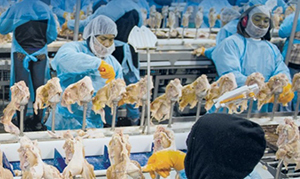 OSHA’s recently updated Avian Influenza page provides information on protecting workers in egg and poultry production, veterinary facilities, pet shops, and food servicing who may be exposed to infectious birds or poultry products. The webpage includes information on hand hygiene and good housekeeping, as well as recommended precautions, such as personal protective equipment, for higher-risk occupations.